This page is dedicated to two very close friends. Les and Fay spent up to three months of each winter with us for a number of years. They became very much a part of the winter furniture around our small motel. 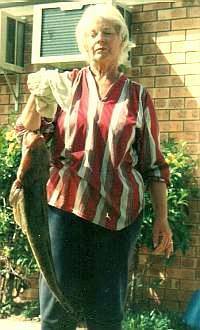 Both were keen on fishing, more than keen would be a better description, which the Boyne area of Central Queensland is noted for, at times!!! Both would spend hours each day enjoying their pursuit. Their winter sojourns to Queensland from cold Victoria could last as long as nine months each year. Our spot on the map being just one of their favorites. I enjoy fishing myself, but not to the extent they both did. Les had been retired for a number of years, what line of work he retired from I never discovered. Our conversations always revolved around, you guessed it, the days catch as well as the one that got away. Fay was very much the old country style of girl, wouldn't hurt a fly. Les, as country as they come, fishing boots didn't come off until he was ready for bed, and then I am not sure. There was always a good deal of dried mud and sand to vacuum up each day when servicing their room. They tended to keep to themselves mostly, and were people of few words unless fishing was mentioned. Les had quite a dry and sharp sense of humor once you got to know him, or he felt comfortable with you. Fay as I said was a gentle soul and seemly shy and like Les took some time to get to know. They were a pair of characters, they would never ring and book, they would just roll up at the door and as it turned out we always seemed to have a room available, even if it wasn't their favorite, No. 9. Something I have noticed with a lot of our regulars, they have a room in our small establishment that they favor over the others, even though they are all basically all the same. When we look at and talk with people, we never seem to consider what may have taken place in their lives to make them the way they appear to be to us, the way they act and what may have affected or shaped their personality. After a few years of slowly getting to know Fay, she confided in my wife, Barb, of a tragedy that had taken place in her life, one she had never gotten over. Some years earlier, Fay had returned to their home after a day shopping or work, which, I am not sure, nor is it important. On returning home that day, Fay had found her eighteen year old daughter hanging form a tree in their rear yard. The girl had hung herself. I have not lost a child, I possibly came close with my daughter to the drug seen, not that she was heavily involved in drugs herself, it was more the peer pressure she was facing, the; 'Puberty blues period.' That time in a young girls life filled hormone changes and mixed emotions. A time the enemy attempts to take full advantage of. I give God the Glory for bringing that trying period in my household under control. But to lose a child to suicide, would be a trial that I would find very difficult to face let alone live with, and praise God one I will never have to face. It would have been the winter of 96. Les and Fay rolled up early in the season, about April, made themselves at home and got down to the usual business of fishing for some six weeks. At the end of their stay they bid us farewell and moved further north to Bowen, another of their spots for wetting a line, telling us they would catch us on their way home for a few weeks before leaving. In the September, October of that year Barb and I decided to take some time off and do some pocking around up north ourselves. Leaving our business in reliable hands we packed our vehicle and were away for most of those two months. On our return home we found that Les and Fay had been back for almost two weeks, but Fay was noticeably ill. She was of a solid build, not over weight more big boned, I guess would be the way one would describe her build. Fay had lost well over two stone in a matter of three months and it was clear that what ever was wrong, wasn't good, spending most of the days lying down. I guessed at the time it had to be cancer. I try not to say a person has a certain disease, but that a person has been attacked by this or that disease. I try not to come into agreement with the enemy who propagates all diseases the human race suffers from, some times it is easier said than done and have to remind myself of Jesus words. Fay and Les were with us for almost another two months, while Fay under went various tests at Gladstone hospital. During this time I tried speaking to Fay of Jesus, the healing power in the Gospel, His promises to us. Knowing that Fay and Les were Catholic, so I naturally thought that Fay would understand where I was coming from knowing that salvation from the Greek "soteria, saos, soterion" not only covers eternal life, but protection here now, healing, to make whole, safety, etc. That He came that we should have life, and have it more abundantly. But my attempts seemed to fall on deaf ears. I don't think I understood the confusion and worry that would have been going through Fay's mind at the time or the server pain she would have been in. And here I am trying to preach a healing Gospel to her, which may at the time have only added to the confusion she may have felt. But I had to try, and try I did. The day came when they both left on the road home to Victoria. The Doctors here in Gladstone, a city only 30 minuets away, had done all they could do for Fay and suggested she get home to her local Doctor, so loaded with medication's they both left. In a short note from Fay after they arrived home she told us that she had been admitted to hospital for treatment, but not much more. It was at this point I started writing to Fay at least once a week. I went through my Bible and dug up every healing scripture in the book, all that I could find and would use them in my letters. As Jesus cursed the fig tree and it dried up from the roots. Mark. 11:20 - 24. "You curse the cancer Fay in His name and it will dry up from the roots. Speak to it in the name of Jesus and command it to go." And may such scriptures I enclosed in my letters, I was trying as I then understood to encourage her to fight this disease form the inside through God's word while the Doctors worked from the outside, I was so persuaded it could be and would be so, if she would only trust God and speak the promises He gave us in His Word in faith, He would honour His word. As a young Christian at the time, saved all of eighteen months, give or take a week. I was enthralled with a few short verses in the Gospel of John. Chapter 10. Verses 27 to 30. I'd come across, but it was the first short sentence of verse 27 that got my full attention. When I was first born again, my wife tells me that days would pass with my face glued in my Bible, now being a Motelier I don't know how I managed this feat, but I do know I was hungry for understanding. On coming across these verses I remember asking in prayer for some time after, "Lord it is written your sheep will hear your voice and I am now a born again son, I want to hear your voice." I have heard number of Pastors, Teachers, Preachers etc. say that they had heard from the Lord. So I thought it only natural that I should hear His voice also. But nothing, all was quite in the ear mail department. In the mean time I kept writing to Fay to encourage her to keep fighting, if not every week at least twice a fortnight. Fay and Les had been home a good three months and summer was well and truly on us, with temperatures rising into the mid to high 30's C. Along with the humidity that tends to accompany it. I had been cutting the lawn at the rear of the motel next to our residence. I normally wait till the sun has gone over the yard arm, some tall gum trees on the property adjoining ours, that time of year, January, before getting the mower out. Even in the late afternoon the heat of the day can still leave one ringing wet, and what is more frustrating that time of year, as you cut the lawn you can look back over your shoulder were you have just been and watch it grow, almost!! It was after one such afternoon of lawn mowing, I had showered, dried myself off, put on some clean gear and went and sat out on our front patio, it was about 7 pm; in the evening, to take advantage of the almost cool northeasterly that drifts in off the sea that time of night. By 7 pm. It is dark here, something that fascinates people from Europe and the United States, we don't go through a twilight, one moment its light then in a matter of minuets it is dark. As I sat there with cool drink that evening, I got this overpowering impression. If I had been thinking about anything that night, it would have been on sailing, getting out on that cool South Pacific and staying there. This impression blotted out all thought, It was not an ear mail as I thought it might be, more like a heart mail I guess would be a way to describe it. Something that rose up from within, but a clear voice like impression. I knew it had to be the Holy Spirit. The message was clear, short and precise. He said. "Write to Fay she is feeling down" I was caught of guard by the suddenness and shortness of it, I wasn't even in prayer at the time, which I thought I'd have to be to ever hear from God. That's when doubt tends to try and creep in. Was that really you Lord? Was that my imagination? I guess you know what was on my mind the rest of that night. Next morning early I rang a Christian friend Ian, and told him what had transpired the night before. Ian is one of those straight to the point types at times and yet other times it can take him forever to tell you something, a bit like me. But this morning he asked "well,have you written?" "Not yet." I replied. "Well get of the phone and do as you were told." Then hung up. Rather than sit there with a hand piece up to my ear and no one on the other end, I hang up myself and put pen to paper. This was to be the hardest letter to start that I have ever written. I must have asked dozens of times "Lord what do you want me to say?" I jotted down our address in the top right hand corner as usual, then Dear Fay on the left hand side of the page under our address as usual, and than just sat there staring at the remaining blank lines. I must have closed the pad ten or so times that day without writing a thing. Next morning early, about 4 am. I came down to our office, got out the pad and sat there staring at that page again. I picked up the pen and wrote "Fay I believe the Holy Spirit told me the other night that you were feeling down." from that point the letter just flowed for twelve lengthy pagers. In the letter I wrote, "Fay when ever you feel this way, just call out Lord Jesus, help me." I repeated this throughout the letter. I also told to her that when she was feeling down to recite this little prayer "Heavenly Father, I believe that Jesus died on the cross for me, that He bore the punishment for all my wrong doing. etc." it was of coarse the sinners prayer, my version of it at the time to work in with Fay's call on the Lord for help. "Strange as it may seem I was trying I to ask your advice last week, Rob, I felt I needed to get my thoughts to you, I guess I needed further encouragement. My Dr. seems pleased I haven't deteriorated as much as he thought I would." I have pasted this page of Fay's letter in the very front of my Bible, and when the chance arises to give testimony I always show this page of Fay's letter to anyone who is interested. It is some what tattered now and the writing faded but it serves to remind me that we have a most high heavenly Father who is more than faithful to perform all that He said He would. I quite often do nothing else but read those few lines over again when I go to my Bible. I wrote Fay one more letter after receiving hers but I was learn latter that she never got to read it. Approximately two weeks later on a Sunday morning Barb took a phone call in our front office, I was making a cup of coffee out back when she answered and was able to hear the conversation. I only caught the first few words Barb said, "Oh Les, I'm so sorry." When I experienced what I can only describe as a sense of absolute tranquillity, a feeling that covered me from the crown of my head to about the thigh region of total peace. I don't know how else to express what I experience than the way I have. Absolute tranquillity. I would like to think it lasted for some time, but it was actually only a few seconds. It was of course Les who phoned to let us know that Fay had passed away. I was not the slightest bit disappointed or upset at the news as a result of the experience. I know or am thoroughly persuaded that it was the Holy Spirit letting me know where Fay was and that she was now totally out of the pain she was suffering down here. I can only guess to what extent my letters may have played in Fay's salvation and I guess I won't until we meet in heaven or at Jesus return for the Church. As with my uncle who accepted Jesus as his Lord and Saviour at 86 years of age a week before he died, so it was with Fay possible a week or so before she died. I know from the time of salvation God has a plan for our lives in the body of Christ. I have often thought of both my uncle, Bob Ryder and Fay. How could their salvation apart from their own eternal life, serve the Church and the unbelieving world? All that I can come up with is maybe God uses such situations and people to demonstrate His great love, mercy and faithfulness toward those who He knows will come into the body of Christ, right up to their last breath in this life. In Romans chapter 11 last sentence of verse 25. Paul states. "That blindness in part has happened to Israel until the fullness of the Gentiles has come in." 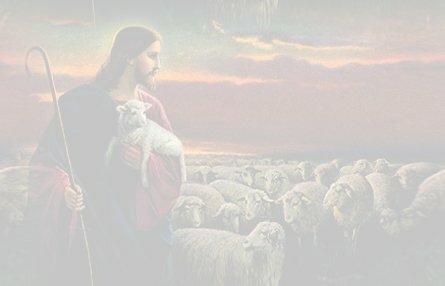 It would appear, that there is a number known only to God of souls who He knows will come into His Kingdom before Jesus returns for the Church. Each soul that comes in regardless of when, plays a part in bringing the day of the rapture that bit closer. I know that God is a God of timing, perfect timing, and that nothing takes place before or after the time appointed by Him. The rapture will also not take place until it's appointed time. What mind could put those two together, the full number of souls and the appointed time? Only one that I know of. Maybe old Bob and Fay served the Church in this way, by adding to that full number. I don't know. But from the lest of us to the greatest, we all have a roll to play in the body of Christ. From Revelation I also know that there is also a full number of Tribulation period saints who come in, under very different and difficult circumstances. The greatest revival known to man will take place during this short seven year period. Acts 2: 19a. "I will show wonders in the heaven above and signs in the earth beneath:" What greater sign to an unbelieving world than the catching away of the entire Church and the resurrection of the saints of all ages, 1.Thess. 4:15 -17. Which will bring the Church age to a close. To think that each one of us has a roll to play in this great event passes my understanding, some times I think that I think to much. I have heard preachers at times say that we can blow our salvation, and I know that there are scriptures that would tend to support this. But I can not imagine any born again believer on the name of Jesus going out of his way to blow his or her salvation knowing what a glorious future awaits the believer. There may be some who have, but I feel they would not truly have been born again in the first place. There is a lot of religious people in this world, but that doesn't mean that they are saved. The experience of my uncle, Bob Ryder who denied God's very existence not to mention Jesus all his life until a week before he died, and Fay Dineen, although I don't think she would have denied God the way old Bob did, she was a gentle soul, and I couldn't imagine her doing so. But it is to Jesus we all must come to be partakers of the salvation that was bought with His Blood. Both Fay and Bob have changed my outlook a lot. Made me take a close look at a lot of the preaching going down, to discern between religious preaching and Gospel. Religion tends to load down the free gift of salvation with conditions. God only puts one condition on salvation, that we receive His Son Jesus as personal Lord and Saviour, John chapter 1. Verse 12. In Psalm 136. All twenty six verses end with the same phrase, "For His mercy endures forever." You would kind of get the idea that God is trying to tell us something here. Wouldn't you? I prefer to listen the Gospel the way Jesus preachers it. John. 14:27a. "Peace I leave with you, My peace I give to you." The peace that Jesus left us was a perfect peace. The kind of peace that enables us to remain calm in the roughest of storms life may dish out. I believe I was given an insight into that peace that Sunday morning that Les phoned. Fay was now living in that perfect peace after a life down here filled with tragedy. When Jesus said, "My peace I give to you" He fully expected us to walk in that peace here, now, but sadly few people even in the Church are walking in that peace completely if at all, including yours truly. That Sunday morning I was given an insight into something worth working toward, or striving for. Seeking and praying for would be more the truth. Total peace spiritual, mental and physical. I spoke to Les for a short while myself after Barb. He seem to be ok in himself at the time, he related to me that Fay had read all of my letters except the last one, she was in and out of comas by the time it arrived. He also told me that Fay had never got over the lose of their daughter, she carried that pain with her the remainder of her life. We never heard from Les again and have since lost contact, I some times wonder where and how he is. If he is still alive and in good health you can bet he is some place fishing. Fay as I knew her with one that didn't get away. She was also very camera shy, if it had not been for the catch I don't think I would have had this only photo of her. Christian Banner Links. Page. 1. Page.2. Page. 3. Our Christian Web Rings. Page. 1. Page. 2. Page. 3. Page. 4.